Plot Summary: Maggie’s dad pays a surprise visit, Holling decides to get an operation, and death comes to town. 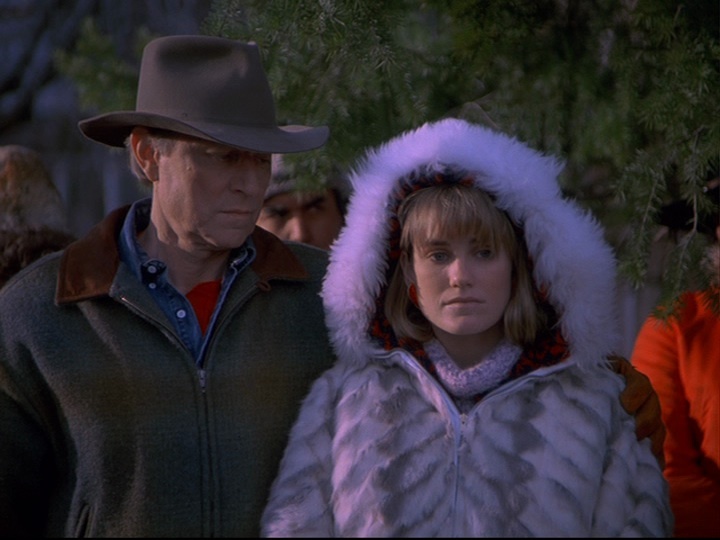 As much as Northern Exposure is a show without an overall season arc (not a dramatic one anyway), it is interesting to see how later episodes nod to earlier ones. Sometimes a reference, a snippet of dialogue or a song from an earlier episode is suggested or reappears in later episodes. (For example, ‘Blue Moon’ features prominently in both 1.8 and 2.1.) If a person weren’t an avid watcher of the show and just dipped in every once in a while, they wouldn’t necessarily miss anything; however, if you are a dedicated watcher, this layering effect brings added connections and connotations to these recurring elements. 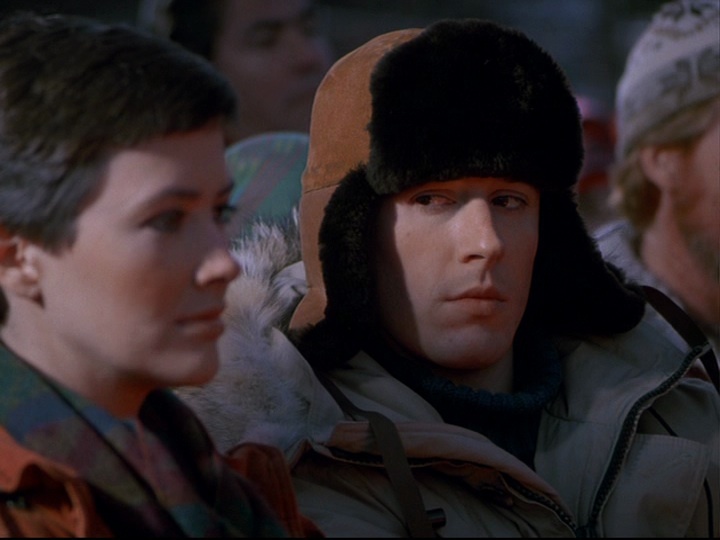 We see 2.3 ‘All is Vanity’ as a fine example of how Northern Exposure episodes past and present speak to each other and even perhaps give each other a little wink. ‘All is Vanity’ echoes another episode that is also about death, 1.3 ‘Soapy Sanderson.’ (It may be a coincidence that both are the third episodes of their respective seasons, but we prefer to think of this as an intentional choice made by architects Brand and Falsey when they were creating the scaffolding for the series. We extended that architectural metaphor a bit too far there, didn’t we? Thought so.) Both episodes include an unexpected death: one of a beloved hermit, and another a complete stranger. It is interesting to contrast how both episodes portray death. In ‘Soapy Sanderson,’ death is treated as a cause for celebration of a loved man’s life, while in ‘All is Vanity,’ the sudden death a of stranger is a reminder of how death waits just around the corner for everyone. In 1.3, a film crew comes to Cicely to make a documentary about the deceased Soapy, and we get a good look at how stories are told (and who tells them, and from whose point of view they are told), and we see Maggie, Holling, Maurice, and other Cicelians perform in front of a camera. 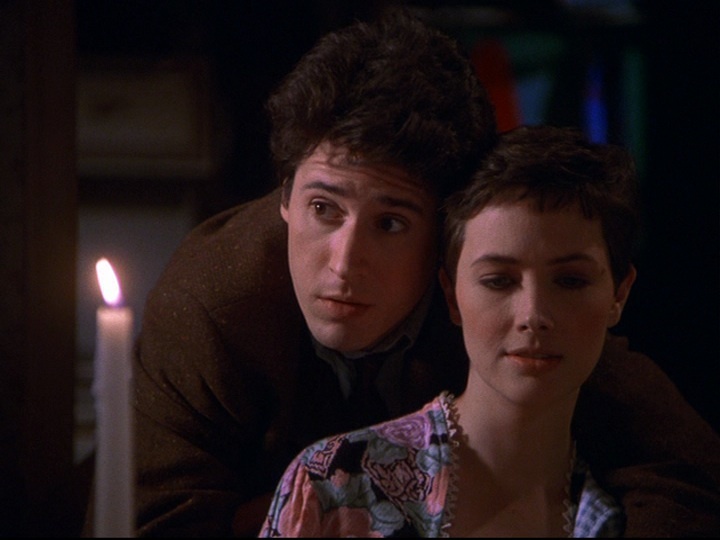 Similarly, 2.3 is also all about performance, with Joel acting as the devoted boyfriend for Frank, Maggie’s father, and in a later scene, Joel again exercises his acting skills by playing the overly concerned and tormented doctor who cannot, for medical reasons, perform the circumcision on Holling. Two strangers – We find out clues about each of them. One surprises us, the other one remains a mystery. Maggie – In 1.3 she discovers how others see her, that she’s not a risk taker when it comes to love; in 2.3 we also see Maggie’s weakness, her lying, her putting on a façade, making her dad believe she is a different type of person. Religion – We learn that Soapy had a doctorate in both theology and mythology, while ‘All is Vanity’ (including its title) is teeming with references and allusions to religious and spiritual practices, such as God, Christianity, the Bible, Judaism, Native chanting, and funeral pyre. Joel + Maggie drawn together – In 1.3, Soapy brings them together through his will, especially the bottle of wine they share, which leads to her flirting with Joel; in 2.3, Frank’s appearance forces them to pretend to be a couple, which leads to Joel’s over-the-top flirtatiousness for her father’s benefit (and Joel’s amusement). Dogs – Both 1.3 and 2.3 begin with dogs. In 1.3, Soapy is feeding his huskies when Maggie arrives by plane; in 2.3, the belligerent patron challenges anyone to a fight who disagrees with his thoughts on the Labrador Retriever. 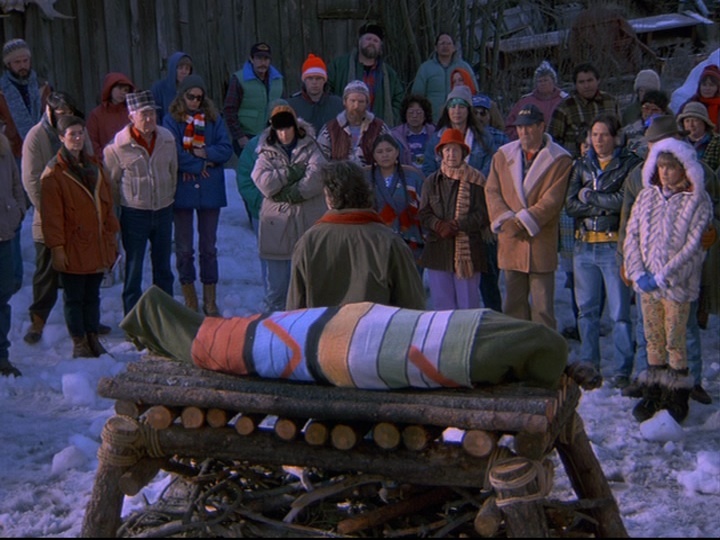 Literary Maggie – In 1.3, Maggie recites from memory the (dubious) “quote” from Chief Seattle that Joel is reading, while 2.3 features Maggie reciting Sonnet 116 at the unknown man’s funeral. Feet – Both 1.3 and 2.3 feature a shot of feet: Soapy Sanderson’s shiny dead feet, and Holling’s feet pre-operation in his nightmare. Interestingly, both scenes are feature a strange mixture of the comedy and uneasiness. Axes, Chainsaws – The dream sequence in 2.3 also features a shiny new axe, which is something also prominently displayed in 1.3 with Maggie chopping wood. 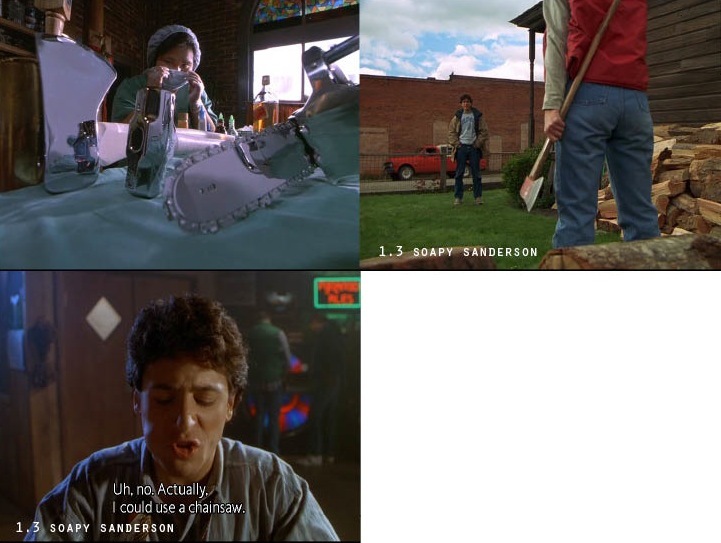 In 1.3, Joel also asks for a chainsaw to cut his steak, while a metallic chainsaw is featured in Holling’s dream sequence. Background music – Both episodes feature the same piano theme, the one that one of us (Shane) seemed to really dislike in 1.3. He liked it much better in 2.3, especially because of the added resonance it gained by sonically linking it to 1.3. Source music – In both episodes, Kitty Wells’ “It Wasn’t God Who Made Honky Tonk Angels” plays from the jukebox during a conflict. Themes/Recurrences: Death; Love; Vanity; Tradition; Delusion; Religion; Hands. The Good: Holling is particularly funny in this episode, from the casual mention that he was thinking about getting a circumcision in Joel’s office, to the secret swigs of vodka, to hollering for Joel in the middle of the night. We also get a better sense of Holling and Shelly’s relationship, and how Holling is far from the assertive one between the two. The Bad: We remain a little unconvinced at the relationship between Maggie and her dad. We don’t know how long Maggie’s been in Cicely, but we find it hard to believe that the assertive Maggie could maintain that ‘daddy’s little girl’ ruse for such a long time. The Notable: Ruth Anne gets a few more lines and gets more scenes in this episode. Plus, her “Don’t Worry, Be Happy!” sweatshirt is pretty great. Maybe not the best, but probably the funniest episode of them all. Maurice and the dead person situation, Holling and the circumcision situation, and especially Maggie and the dad situation had me laughing out loud. Joel also does a good job handling these situations, even if he’s taking the piss out of Maggie. Yes, it’s a good one, and the ending is pretty epic.